Oliver Kita Chocolates in Rhinebeck invited Hudson Valley Good Stuff to meet Eric Chase, director of Sales of Valrhona Chocolates, and Sarah Kosikowski, corporate pastry chef for Valrhona, for a private chocolate tasting of Dulcey Blond Chocolate, a new Valrhona product that launched in 2012. How can a chocolate loving Hudson Valley blogger refuse an invite like this? Kita has known Chase for years, and respects his opinion as a chocolate expert. "I see Eric at all the major events and chocolate shows. What sets Valrhona apart from all the others is they work with the very elite pastry chefs, but they also embrace artists. He doesn’t have to be here today," says Kita. The two even break bread together when time allows. Chase is happy to be here though, and enjoying a mid-week getaway to the Hudson Valley from the city. "We’re trying to help him with any technical issues a chocolateur might come upon when they are trying to emulsify, put on a coating to a different ganache, or balance problems. We’re trying to create balance in the world of chocolate," says Chase. After a blockbuster Valentine's Day, Oliver Kita is working on getting ready for the following season, which includes planning special Mother's Day chocolates. Today, though, it was all about the new Dulcey chocolate from Valrhona, and also getting feedback on two vegan chocolates the store sells, the palet d'argent and brut. While Kita and Kosikowski went into the kitchen to talk shop, Chase guided me through a chocolate tasting of four different couvertures (high quality chocolates made for baking) and the new biscuity flavored blond chocolate Dulcey (32 percent cocoa butter). Couvertures were from Ghana, Madagascar, Ecuador, and the Dominican Republic (all 66 percent dark). Although I have been a chocolate enthusiast my whole life, I've never been to a "chocolate tasting" and asked to describe how the different chocolates taste on my pallet. Chase stopped me before I popped the chocolate in my mouth. "Wait, you must get the aroma first!" he said. "Now, put it all in your mouth. Bite down on it. You're allowing some of the aromas to go through the olfactory. Where are you tasting it on your tongue? Where is it popping? Where is it going crazy?" "Umm. I think it is sort of citrusy," I said. "Ah, that acidity from the fruit. It is so different from Ghana! The chocolate should enrobe the tongue"—Wow! I never thought of chocolate like this before. When we first sat down, we tried two vegan chocolates, palet d'argent and brut. Although the chocolate bite of palet d'argent tasted perfectly divine to me, Kita, a perfectionist I suspect, pointed out that the top part broke apart because of the consistency. (One challenge in making vegan chocolate is how to replicate the creamy taste without using dairy). Kosikowski talked about different options, which included tweaking the recipe and using a chocolate shell that would hold a softer liquid interior better. Kita takes great care in selecting exciting packaging. He told me that during the holiday season, he created big suitcases full of chocolate ($140) along with an attache case ($100) filled with chocolate, and both gift items sold-out. He realizes that his customers' love for big packages with lots of chocolates inside conflicts with his personal fondness for the French style of having small exquisite packaging with a small selection of expensive, but amazing chocolate inside. "The first time you buy it because the packaging is pretty, but at the end of the day, it has to be a good product. 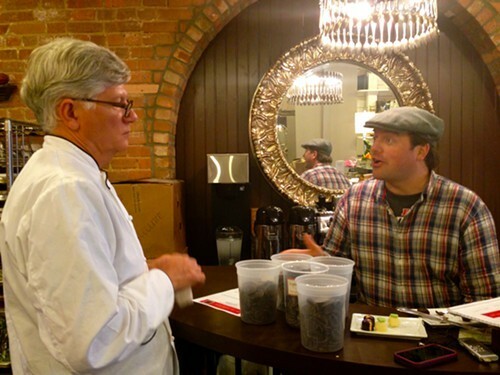 You have to have an experience or you don’t re-buy—it has to taste the way you want it to taste," says Chase. For Mother's Day, Oliver Kita will be offering a gift for Mom in the form of an open book, after the popularity of book club. That is one book I don't mind eating! It was a fun hour of chocolate education, and I did walk away with a better knowledge of what real chocolate should taste like. During our tasting, Chase joked that if he gave me a Hershey bar now, it would taste totally different. I know what he was getting at. Once you taste really fine chocolate like this, it is hard to go back to the ordinary stuff. As I was leaving, Oliver Kita gave me a bar of his best-selling chocolate bar—Beekman Buttercrunch with sea salt and 70 percent dark chocolate. I reluctantly shared it with my husband last night. It was out of this world, and really too good to share! 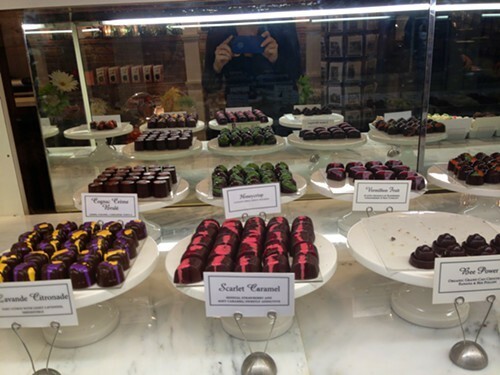 Find more Hudson Valley foodie reviews at writer Vanessa Ahern's blog, HudsonValleyGoodStuff.com.